Niweng Cave It is located at the hillside of Mount Chuyang. Grottoes of different sizes are formed after continuous washout of its protolith, eugeogenous massive magma fragments, by the Haoxi River and crustal uplift. Legend has it that Ni Zi, teacher of Fan Li, lived in solitude here after he helped Yue State to exterminate Wu State. That’s why it got the current name. Some fellow countrymen of the Ming Dynasty ever studied here, including Fan Xianke, a censor; Li Zhi, minister of Penalty Ministry; and so on. There are 60 cliff inscriptions of various generations in the cave. They were all consummate calligraphic arts and showed various character styles. Among them, the stone inscription of Niweng Cave by Li Yangbing, a carving master was of particular value. As quintessence of Xiandu cliff inscriptions, the cave is a key cultural relic under national protection. Impending Pavilion The inscription of Niweng Cave is the most valuable treasure among Xiandu cliff inscriptions since it was a work of Li Yangbing when he was the magistrate of Jinyun County in Qianyuan reign of the Tang Dynasty. Li Yangbing enjoyed reputations of Carving Master and King of Calligraphy in his age. In order to protect this rare treasure, ancient people specially built a pavilion over the inscription to prevent it from rain and wind. Suspending in midair, the pavilion was built against the rock; hence it was named Impending Pavilion or Calligraphy Protection Pavilion. Valley of Morning Light There are 3 interconnected grottoes in Niweng Cave, respectively, Lamp Cave, Rice Sieve Cave and Reading Cave. The sunlight filters through three caves in different directions when the sun rises in the morning. It makes a spectacular view named Three Openings of Light Valley. The cliff inscription Chu Yang Gu written by Yan Zhenqin, a famous calligrapher was in the northernmost part of the cave. The calligrapher missed a dot stroke in the first Chinese character on purpose since the first ray of sunshine will make up for this dot in the morning. In Chuyang Mountain, there is a cave as deep and secluded as a valley. The cave faces east and is the first to be illuminated by the morning sun every day; hence it is called Yanggu Cave or Morning Sun Cave. Dufeng Academy Leaning against Mount Hao and facing the Lianxi River, the academy is one of the eight major academies in the Song and Yuan Dynasties. It was built in memory of Zhu Xi, a renowned neo-confucianist of the Song Dynasty, since he ever lectured in Xiandu. Zhu Xi gave lectures here in the 7th year of Emperor Chunxi’s Reign. In the middle of Emperor Jiading’s reign, Ye Sichang first proposed to build a worshiping hall at the foot of Crouch Tiger Rock in Sunchuan. Then, Qian Yueyou expanded and renovated the hall in the7th year of Emperor Xianchun’s reign. Unfortunately, it was destroyed by Zhu Chengyuan, the County Magistrate in reign of Emperor Hongwu, the Ming Dynasty. In the 12th year of Emperor Tongzhi’s reign, the Qing Dynasty, people of Nanxiang rebuilt the academy at the present site. The academy, of typical architectural style of the Late Qing Dynasty, covers a land area of twelve thousand square meters. Its main building is a three-bay three-room depth structure, together with ten wing rooms on the right and left side respectively. Outside of the northern wing room, there was Lu Temple (Confucius Temple at present). Ganmu Rock It is an isolated cliff facing the east on the southern side of Mount Qunyu, just like a screen erecting along the river. In Chinese, Gan means reddish black color and Mu means immersion, so Ganmu Rock means a black rock immersed with reddish color. On the rock, there are cliff inscriptions of Xian Du by Sha Menghai, a Master Calligrapher. Inscribed in 1981, the strokes of the characters are harmonious and of integral whole. It was a masterpiece of Sha in his later years as well as an outstanding work among Xiandu cliff inscriptions. Wang Gao, instructor of Jinyun in Emperor Qianlong’s reign of the Qing Dynasty, once wrote a poem titled Ganmu Rock to praise its beauty. It says, drowning in cool rain is the lofty reddish black rock, and over the verdant mountain vaguely floats the morning light. Both the Fairy Peak and the Five Elders Peak are residual rock mass of the early rhyolite platform margin as a result of weathering, erosion and collapse and other natural effect. Peak of Fairy Maiden Roughly a dozen cylindrical rocks of various heights stand on the southwest side of Mount Qunyu. With indented bottom and gurgling water flowing through, they are just like bathing beauties with hair on shoulders who dress up themselves by facing the natural moon mirror behind Dufeng Academy far apart. Lying to the east of Ganmu Rock and Five Elders Rock, Peak of Fairy Maiden enjoys the sunshine early in the morning, so it is also called Dongmeng Rock, i.e. Rock Bathing in the Early Sun. Both Peak of Fairy Maiden and Peak of Five Elders are residual rock mass at the edge of early rhyolite platform due to natural effect of weathering, erosion and collapse. Moon-mirror Rock There is a rock on the ridge of Mount Hao where Dufeng Academy is located. It is as thin as a brocade screen with a natural hexagon hole. In the distance, it looks like the moon or a mirror. Together with Peak of Fairy Maiden, it composes the spectacle that fairy maidens are looking into the mirror. The steep and precipitous rock screen and beautiful light-through caves are formed due to rainwater erosion, natural weathering and gravitational collapse of multiple joints of the rhyolite. Peak of Five Elders Boarding Peak of Fairy Maiden on the north, five remarkable rocks stand with heights of 10 to 30 meters. Solemn and serene, they are just like five elders. That’s why it is called Peak of Fiver Elders. According to the legend, the five elders were respectively Huangdi in the center, Blue Emperor in the east, Red Emperor in the south, White Emperor in the west and Black Emperor in the north. They used to cultivate themselves to be immortals in Mount Song, Mount Tai, Mount Heng (Hu’nan), Mount Hua and Mount Heng (Shanxi). They gathered in Xiandu since Huangdi began refining pills for immortality at Dinghu Peak. Bathing in the sunshine at both sunrise and sunset every day, they ascended to heaven after the success in pills for immortality. In the center of a field on the north of the Five Elders Peak, there is a seal-like giant rock which is called Imperial Seal of Huangdi. Imperial Seal of Huangdi In the center of a field on the north of the Five Elders Peak, there is a seal-like rock named Imperial Seal of Huangdi, commonly known as Seal of Huangdi. Emperors in ancient times usually had two seals, one for private affairs and the other for official business. The seal for official business was called imperial seal. Legend has it that Li Mu, a general of Huangdi, was once defeated in a battle because he received a fake order from the enemy. Then, Feng Hou, a clever subordinate of Huangdi, invented the imperial seal. From then on, all political documents approved should be under seal. It is said that men of talent come out in succession in Jinyun mainly due to the Imperial Seal of Huangdi here. Since 1670, the 9th year of Emperor Kangxi’s reign in the Qing Dynasty, there’s no successful candidate in the highest imperial examinations in the county for 206 year just because a geomancer carved two slits on the stone. Cave of Echoing Rock There is a cave on the southeast hillside of Mount Hao. Located near the mountain trail, it is slope in shape and can hold dozens of people. At the entrance to the cave, there is a stone inscription that reads Echoing Rock written by Li Ye, magistrate of Jinyun County, in 1851, the 1st year of Emperor Xianfeng’s reign in the Qing Dynasty. Since the environment nearby is tranquil and bushy, pedestrians can hear echoes of their steps and talking when they passed the cave. If someone knocked the cave wall with a stone, there came clear sound that is as melodious as that of a bronze drum. Therefore, the cave is called Cave of Echoing Rock. 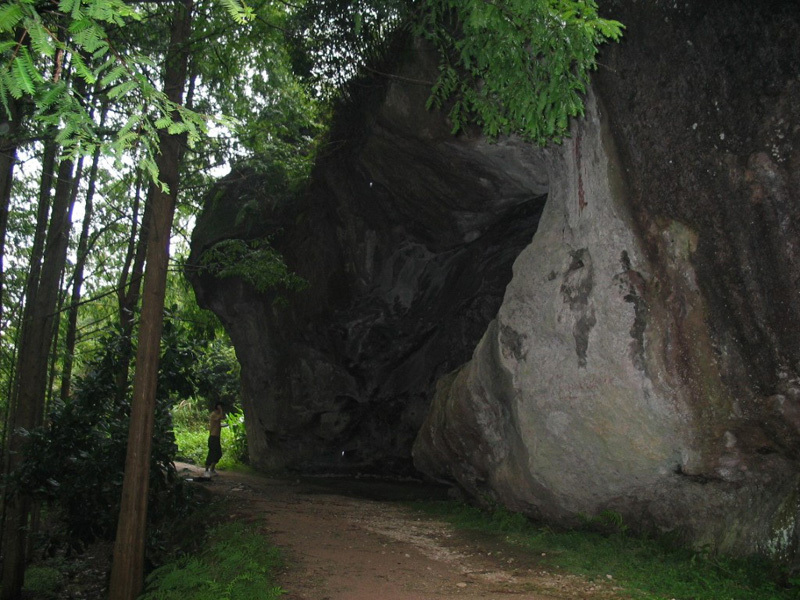 Legend has it that Yang Lang ever lived in this cave and handed out medicines to the passers-by; hence it is also known as Yang Lang Cave. Rat Stealing Oil Legend has it that Blue Pond used to be an oil tank full of cooking oil. One day, a rat sneaked in from the hill behind, and put its pointed mouth into the oil tank to eat oil greedily. It happened that an immortal passed by. At the sight of it, he brushed lightly with his celestial broom and turned the rat into a hill and the oil tank into Blue Pond. From then on, a vivid spectacle that a rat is stealing oil came into being. The geomancers affirmed it a place with good geomantic omen since the rat is the first in Chinese zodiac. Pond of Leaping Carps The pond is also called Blue Pond with a Crane Stopping Pavilion in it. According to the legend, Huangdi and Yang Yin, an ancient immortal, once stop their cranes here. The hill behind the pond looks like a rat putting its mouth into the pond and gets the name Rat Stealing Oil. It is said to be a place with very good geomantic omen. Once an ancestor was buried here, there would bring at least 18 successful candidates in the highest imperial examinations in later generations of the family. However, a geomancer plotted and destroyed the geomantic omen of the place when the relationship between him and owner of the tomb went sour. Then, it rained heavily with thunder and lighting and 17 carps leaped out of the pond. When the 18th carp was about to leap out, the geomancer drove it back into the pond due to a sudden sense of mercy. Therefore, only one crippled candidate succeeded in the imperial examination among descendants of the family. That’s why the pond was named Pond of Leaping Carps. Green Lotus Rock Legend has it that golden lotuses, on which Huangdi treaded when he ascended to heaven, grow in Dinghu Lake. The flower, with fragrance spreading widely, attracted numerous immortals to pick. When Jade Emperor heard of it, he sent divine generals to transplant the flowers to the rear garden of the heavenly palace. Just at this time, two lotus petals, one is big and the other small, fell off and drifted in the wind. The small one fell down in Jinhua Pond at the foot of Mount Chuyang and turned into a rock in shape of a lotus leaf. Then it was called Green Lotus Rock. On the right side of the rock, there is an inscription of Green Lotus Rock in Chinese characters by Li Bochun, a successful candidate of highest imperial examination in 1571, the 5th year of Emperor Longqing’s reign in the Ming Dynasty. It was inscribed in 1590, the18th year of Emperor Wanli’s reign. 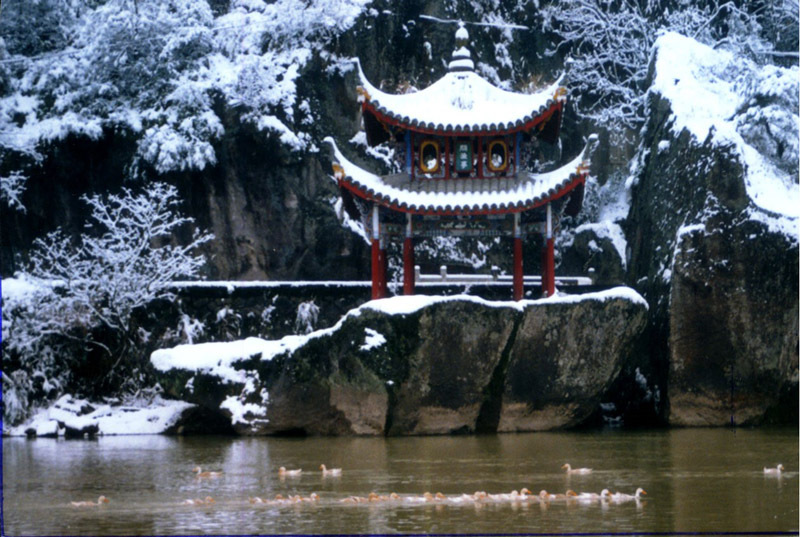 In addition, there is a pavilion named Wenyu Pavilion on the rock. Wenyu Pavilion It is an ancient pavilion on the Green Lotus Rock. Featured with octagonal tented roof with double eaves, the pavilion is richly ornamented with double fishes on the ceiling. 5 meters in bottom perimeter and 7 meters in height, it is an ideal place for break-taking and fishing by the stream. During Emperor Jiajing’s reign of the Ming Dynasty, a person who styled himself as Laixian visited Fan Xianke, a provincial censor who lived in solitude in Niweng Cave. He got lost here and asked a fisherman for direction. Later, he wrote his expression in a poem, which says in a water cave thick with mist, seated celestial elders playing chess. Seeking after them, I got lost. Led by a fisherman, I entered flower clusters. In memory of him, people built the pavilion and named it Wenyu, literally meaning asking the direction from fishermen. Junzi Rock Junzi Rock was originally a natural stone screen stretching into Haoxi River from Mount Chuyang. It stood like a firm column in the midstream and blocked water from upstream of Haoxi River for Green Lotus Rock and Wenyu Pavilion. Thus it was called Junzi Rock. Junzi literally means a person with noble characters. In 1958, the central part of the stone screen was blown off to make way for the highway. As a result, many cliff inscriptions written by celebrities were destroyed, including works of Wang Shipeng, No. 1 Scholar in the Southern Song Dynasty. Only three stone inscriptions were reserved. They are respectively Junzi Rock, Wenyu Pavilion and Shan Yi Ping Ji.